BURBANK, Calif. – February 4, 2008 – NBC and the Ford Motor Company will partner to get viewers rolling with the “Ford â€˜Knight Riderâ€™ Giveaway Sweepstakes,â€ during the action adventure “Knight Riderâ€ movie of the week on Sunday, February 17 (9-11 p.m. ET) when viewers will have the chance to win one of four new boldly designed and high-tech Ford automobiles. The grand-prize winner will receive a 2008 Ford Shelby GT 500 KR with a manufacturerâ€™s suggested retail price (MSRP) of $79,995. The first of this highly sought after performance car recently sold at a charity auction for $550,000. In addition, one first-prize recipient will get the keys to a Ford Edge Limited AWD (MSRP $32,070); a second-prize winner will drive away with a Ford Fusion V6 SEL AWD (MSRP $24,385), and a third-prize recipient will receive a Ford Focus SES Sedan (MSRP $16,375). The total (MSRP) estimated value for all four vehicles is approximately $152,825. The “Ford â€˜Knight Riderâ€™ Giveaway Sweepstakesâ€ begins at 8 p.m. (ET) on February 17 during an episode of “American Gladiatorsâ€ (7-9 p.m. ET), continues with the movieâ€™s broadcast (9-11 p.m. ET) and concludes the next day, Monday, February 18. At four different, pre-determined intervals during the “Knight Riderâ€ broadcast – approximately every 30 minutes – viewers will be invited to participate in the sweepstakes by answering a question pertaining to the movie by going online. Contestants will be directed to the website www.nbc.com/knightrider. A correct answer is not required for an entrant to make an entry into the sweepstakes. There is a limit of four entries per person for the entire sweepstakes period. “Knight Riderâ€ â€” NBCâ€™s iconic 1980s television classic that became a runaway success â€” comes roaring back to life on the network with an updated sequel movie event. Earlier, NBC unveiled the new customized KITT (Knight Industries Three Thousand) Ford Mustang to be featured in the series. NBCâ€™s partnership with Ford Motor Company provides for a unique content opportunity that makes the Ford Mustang one of the stars of the movie. The three cars to be employed in the series include the KITT Hero â€” a Ford Mustang Shelby GT 500 KR that is playing the part of the everyday Hero car with 540 horsepower; the KITT Attack â€” a super high-speed version of the Ford Mustang Shelby GT 500 KR Hero car that transforms into Attack mode with the help of air-ride technology and specialized body parts â€” and a KITT Remote, which is a driverless Ford Mustang Shelby GT 500 KR version of the Hero vehicle. As the original story resumes in this sequel, KITT is absolutely the coolest car ever created: its supercomputer capable of hacking almost any system; its weapons systems efficient; and its body â€” thanks to its creatorâ€™s work and nanotechnology â€” is capable of actually shifting shape and color. Plus, its artificial intelligence makes it the ideal crime-fighting partner: logical, precise and possessing infinite knowledge. It is the ultimate car â€” and someone will be willing to do anything to obtain it. “Knight Riderâ€ stars Justin Bruening (â€Cold Case,â€ “All My Childrenâ€), Deanna Russo (â€NCIS,â€ “The Young and the Restlessâ€), Sydney Tamiia Poitier (â€Veronica Mars,â€ “Grindhouseâ€) and Bruce Davison (â€Breach,â€ “Close to Homeâ€). In addition, David Hasselhoff (NBCâ€™s “Americaâ€™s Got Talentâ€) â€” who starred in the popular lead role as Michael Knight for four seasons during the original series â€” returns as the same character in a special guest-star appearance. David Bartis (â€Heist,â€ “The O.C.â€) and Doug Liman (â€Mr. and Mrs. Smith,â€ “The Bourne Identityâ€) serve as executive producers. David Andron is supervising producer and writer. Steve Shill (â€Dexter,â€ “The Tudorsâ€), also a co-executive producer, directs the two-hour movie from Universal Media Studios and Dutch Oven Productions. 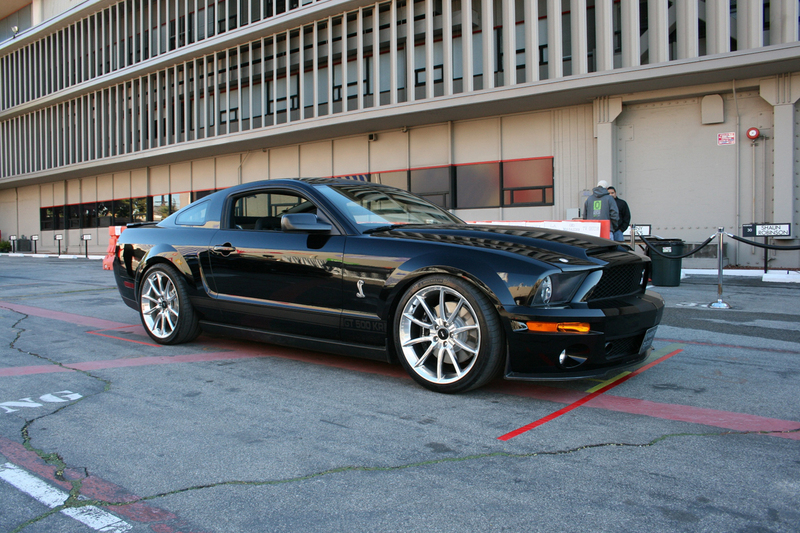 Wie ein Shelby GT500KR zum Knight Rider Star wird!